Elvis Server can be tightly integrated with Enterprise Server to make the assets that are stored in Elvis available in the workflow of Enterprise and to archive published publications from Enterprise to Elvis. Enterprise Server. When a file is accessed through Enterprise (for example by placing a file on a layout in InDesign with Smart Connection installed), it retrieves the original file, the file preview, the thumbnail, metadata and versions from Elvis. Likewise, when changes to the metadata of a file is edited in Enterprise, the Content Source plug-in ensures that these changes are also made to the file in Elvis. When a file that is stored in Elvis is used in Enterprise, a reference to the file in Elvis will be stored in Enterprise. Note: This reference is sometimes referred to as a 'shadow object'. When the Elvis file subsequently needs to be worked on, the original file — together with the file preview, thumbnail, metadata and versions — is retrieved from Elvis and stored on the local system of the user. 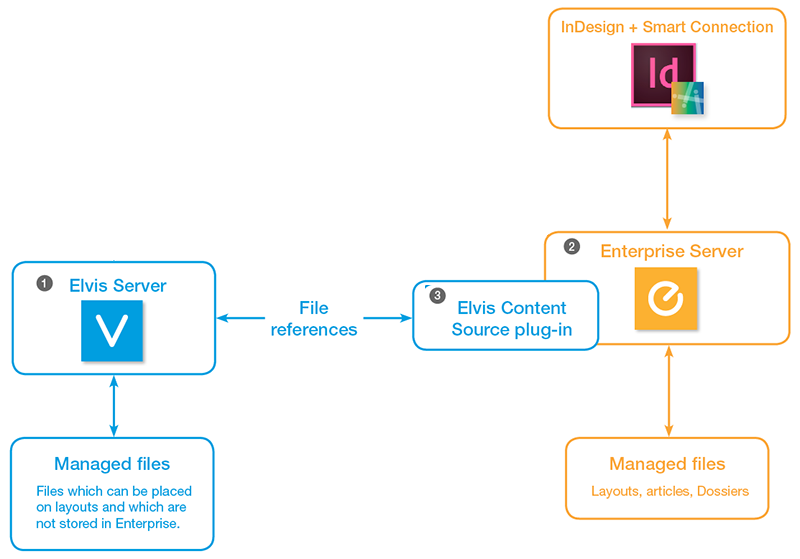 An InDesign user drags an image from Elvis onto a layout that is stored in Enterprise. At this stage, a reference to the file in Elvis is stored in Enterprise. ause this requires the original file, it is retrieved from Elvis (together with all the supporting files) and stored on the local system of the user. Note: A file from Elvis can only be used in one Enterprise Server at a time. When importing files from Enterprise in Elvis or exporting files from Elvis to Enterprise, the default behavior is that references are created in Enterprise. Should copies be created instead, this can be configured. For more information, see Archiving Enterprise files to Elvis 6. For a seamless integration between Elvis and Enterprise it is important that all clients use the same user to log in. The user therefore needs to be present in both Elvis Server and Enterprise Server and have the proper permissions assigned. The use of LDAP is advised. For more information, see Integrating Elvis 6 in Enterprise Server 9.